I love this card. The card’s meaning, by its title, is clear, at least to a degree. Whether the “wounds” suffered are physical, emotional, spiritual, or financial (or all of the above), a miracle is taking place to heal these wounds. Divine intervention, a Universal gift. This is an opportunity to let go of worry, fear, stress, or any other harmful thought energies – and to have faith that healing is in progress. 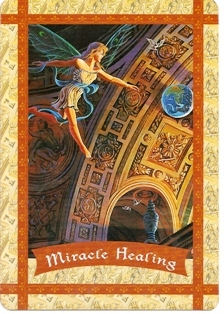 Card Meaning: Expect a miracle. You have prayed for assistance, and it is forthcoming. The more completely you SURRENDER your situation to God, the more rapidly you will realize your healing. Definition: Heaven is completely on your side, and your prayers have been heard and answered. You needn’t beg or petition heaven to help you, as your situation is already healed in truth. The healed reality is one of several parallel realities currently available to you. You have the choice, through your thoughts, emotions, and intentions, to experience the highest possible reality for yourself. You access your healed situation through FAITH and GRATITUDE. To feel these powerful catalyzing emotions, say mentally or aloud to God, “I am tired of thinking about this situation. I don’t want to deal with it any longer. Here, I’m giving the entire thing to You so that You can think about it and resolve it. Thank you so much for taking care of everything.” Then, DETACH completely from the situation. See yourself placing it in the palm of God’s loving hand. Feel grateful that your situation is now resolved, and be open to the creative solution that greets you. Affirmation: In truth, everything and everyone, including myself, is healed right now. I focus on this truth, instead of illusions of FEAR.